With the Gear VR you get a bigger field of view, smoother images. Incredibly low light leakage and reflection prevention. It's game on. Gear VR works seamlessly with Galaxy smartphones. Compatible with both USB Type-C and Micro USB, you just need to snap on the connector module for your phone, and you're done. This is where your VR journey begins. Browse through games and experiences or explore what's new on the Oculus Store. Meet up with friends and discover a world of possibilities—all from your virtual home. Supreme comfort You're ready to explore new worlds, engage in tense action. You need a headset that's well made, and engineered to fit better than ever before. Like the Gear VR. Complete focus With the Gear VR you get a bigger field of view, smoother images. Incredibly low light leakage and reflection prevention. It's game on. Convenient control With a tap or a swipe. The larger and now completely flat touchpad exists for precision and control. The new Home Key takes you straight back to Oculus Home. 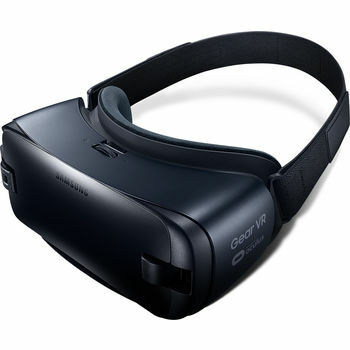 The Galaxy connection Gear VR works seamlessly with Galaxy smartphones. Compatible with both USB Type-C and Micro USB, you just need to snap on the connector module for your phone, and you're done. Oculus Home This is where your VR journey begins. Browse through games and experiences or explore what's new on the Oculus Store. Meet up with friends and discover a world of possibilities—all from your virtual home.